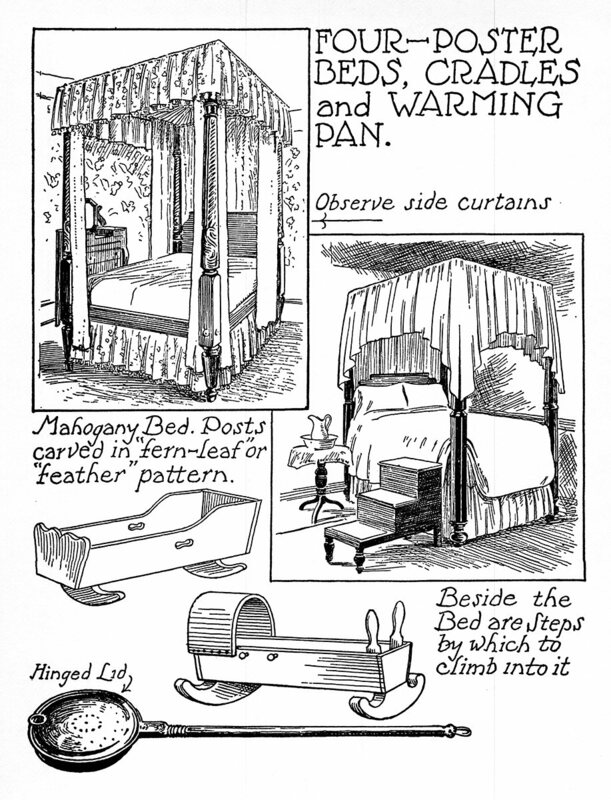 Bedsteads were furnished with a canopy, called a tester, and side curtains which could be drawn close to keep out draughts and "night air, " which was thought to be harmful to health. Thick feather mattresses often built the bed so high that steps were required to enable the sleeper to get into it. 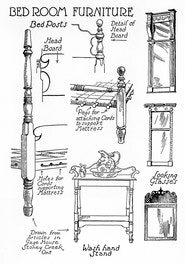 A long-handled warming pan—a copper or brass dish in which was placed glowing charcoal or embers from the fireplace—was used to warm the sheets before retiring. Many bedrooms were unheated, though some had small open fireplaces. Beds such as those illustrated were used only by a few well-to-do settlers who brought them from their earlier homes in Great Britain or the American colonies, or acquired them at a later period when the pioneers had reached some prosperity. 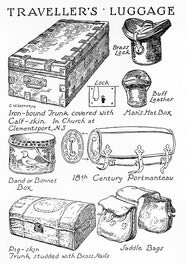 Much of the pioneer furniture was home-made, in spells of leisure on rainy days and in winter, or by a neighbouring carpenter.